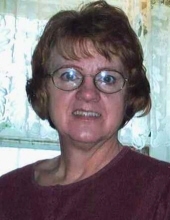 Mary A. Sherfield, age 70, of Rib Lake, WI, passed away on Wednesday, February 13, 2019 at her home under hospice care. Mary was born February 5, 1949 in Rib Lake to the late John and Theresa (Haider) Thums. She grew up and attended schools in Rib Lake. Mary was later married to Loren Sherfield on May 2, 1970 at St. Ann’s Catholic Church in the Town of Greenwood. Mary enjoyed traveling, gardening and spending time with ‘her kids’. She farmed and worked in a factory most of her life. Maci Sherfield, Kelli Lueck and Josh Lueck, all of Rib Lake. her Sisters-in-law, Patricia Thums and Mona Thums of Isabella, MN, Kathy Thums of Mount Vernon, IN, Jean Thums of Medford, WI, and Mary Thums of Rib Lake, WI. Mary was preceded in death by her Parents, ten Brothers and one Sister. A Celebration of Life Visitation for Mary Sherfield will be held on Saturday, February 23, 2019 at the Rib Lake Ice Age Pavilion from 1 PM to 5 PM. To send flowers or a remembrance gift to the family of Mary A. Sherfield, please visit our Tribute Store. "Email Address" would like to share the life celebration of Mary A. Sherfield. Click on the "link" to go to share a favorite memory or leave a condolence message for the family.